1970's 14k gold spinning ball ring created by Han Hansen of Denmark. 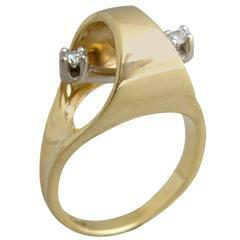 Ring has a Florentine finish on its small sides, while the rest of the ring has a polished finish. It is a finger size 5.75 - 6 and stands .75" atop the finger. Signed HaH, 585, Denmark and in very good vintage condition. Hans Hansen Sterling Silver Ring. Ring size 49 / US 5. Weighs 15.0 grams / 0.53 oz. Hans Hansen Sterling Silver Ring. Ring Size 50 / US 5. Circle shaped ornament is 3 cm dia / 1 3/16 in. Weighs 16.6 g / 0.59 oz. 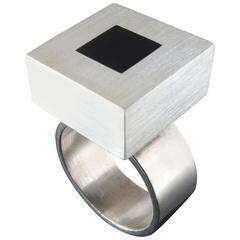 Hans Hansen Sterling Silver Ring. Ring Size 53 / US 6.5. Weighs 16.6 g / 0.59 oz.